Three Engineering and Applied Science professors have joined forces to work with Northrop Grumman Corporation on the largest sponsored research project from industry that Caltech has undertaken in recent history. The project is called the Space Solar Power Initiative (SSPI), and the co-investigators are applied physicist and materials scientist Harry Atwater, electrical engineer Ali Hajimiri, and aeronautics and civil engineer Sergio Pellegrino. Soon after the official announcement by Caltech and Northrop Grumman, the professors sat with ENGenious to discuss the idea, their plan for moving forward, and the implications of their success. SSPI is a strikingly ambitious and challenging plan to send millions of clean kilowatts to an energy-hungry planet imperiled by climate change. The goal: the creation and launch into orbit of thousands of identical space vehicles to form a constellation that maintains a precise shape. 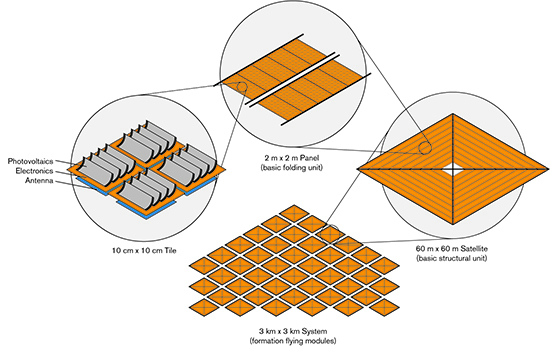 In the airless weightlessness of space, each vehicle will transform itself into an element of a modular power-generating space station with the square mileage of a city park, each module unfolding into a structure with the thinness of paper, made up of a network of billions of greeting-card–size tiles. Control systems on board the station will maneuver these giant tile sheets to keep one side continually facing an unsetting sun. The sunlit-side surface will be a layer of material nanostructured to capture the energy of the illuminating sunlight. As this captured energy passes through the tiles, another structured layer will continuously convert it into radio-frequency power, which in turn will be beamed to Earth using focusing mechanisms similar to those now used in phased-array radars, which will send the radio-wave power earthward, in real time, to receiver ground stations located at specific destinations on our planet. The ground stations will be receivers that can absorb the radio-frequency power and convert it into electrical energy. Some of these receptors will feed into existing electric utility grids. Others may be isolated micropower networks at remote off-grid locations or even individual farms or factories, all receiving a continuous infusion of power from the sky, 24 hours a day. A tiny fraction of the solar energy captured will be converted on board to electrical energy to power the data-processing and communication modules that maintain and repair the station’s structure and respond to signals from Earth. 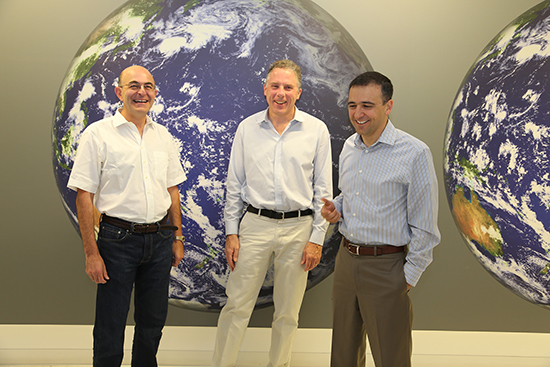 Each of the three leaders of the Caltech team is tackling a different part of this formidable system. First, one surface of each tile in the immense array must be able to capture solar energy efficiently. The research group led by Professor Atwater will design and prototype ultralight photovoltaic tiles, taking advantage of the reduced structural demands of zero-gravity conditions. The solar energy captured by these tiles must then be converted into radio-frequency (RF) power that can be efficiently transmitted through clouds and atmosphere to Earth, even on cloudy days. Professor Hajimiri’s research team will create the integrated system that will convert the direct current (DC) solar power to RF power and send the RF power from the phased array, which can then route RF beams to a single or to multiple receiving ground stations. Finally, Professor Pellegrino’s research group will design and prototype the key components needed for the architecture of a hundred meter-scale, self-folding, origami-like, flexible, ultralight structures that can adaptively change shape and orientation in real time. The starting point and basic conceptual element for the project is the “tile,” a 10 x 10-centimeter solar-power converter and RF transmitting antenna that has already been created in mockup form by the SSPI team. The project grew out of a working group on future space technologies for renewable energy, established by former Caltech President Jean-Lou Chameau. Ares J. Rosakis, then Chair of the Division of Engineering and Applied Science, saw the potential opportunity. “Ares said, ‘You might want to begin a dialogue on this subject and see what can be done,’” Atwater recalls. From this initial dialogue, insights and ideas arose that finally culminated in the establishment of the $17.5 million project. “The Space Solar Power Initiative brings together electrical engineers, applied physicists, and aerospace engineers in the type of profound interdisciplinary collaboration that is seamlessly enhanced at a small place like Caltech,” said Rosakis in his announcement of the project in April. The potential benefits are enormous, Atwater says. “About a quarter of humanity has no electric power whatsoever. And so this is an enabling technology that could leapfrog the electric-power transmission grid on Earth, and have the same effect that the cellular phone system had on communications,” giving access to phone use in places without existing copper wire–based landline phone infrastructure. Harry Atwater is Howard Hughes Professor of Applied Physics and Materials Science and Director of the Joint Center for Artificial Photosynthesis. Ali Hajimiri is Thomas G. Myers Professor of Electrical Engineering and Executive Officer for Electrical Engineering as well as Director, Information Science and Technology. Sergio Pellegrino is Joyce and Kent Kresa Professor of Aeronautics and Professor of Civil Engineering and Jet Propulsion Laboratory Senior Research Scientist.